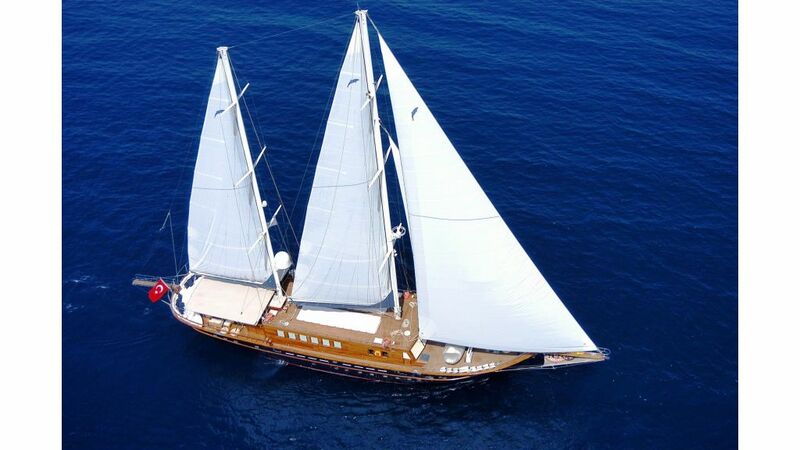 Motor sailing yacht SEA DREAM is a 45 meters 148 ft steel hull, Ketch rigged schooner which was built in Bodrum in 2005 and refitted extensively in 2013. 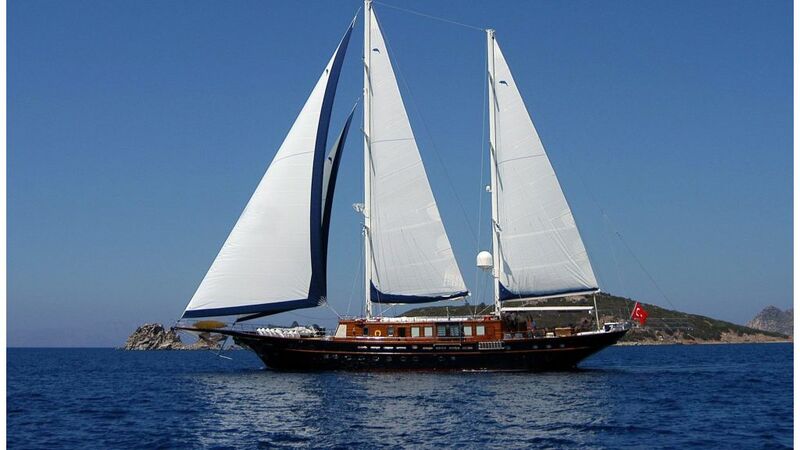 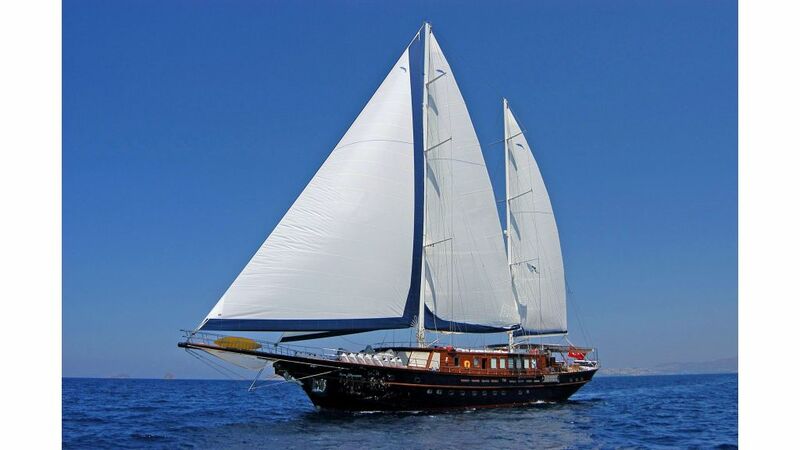 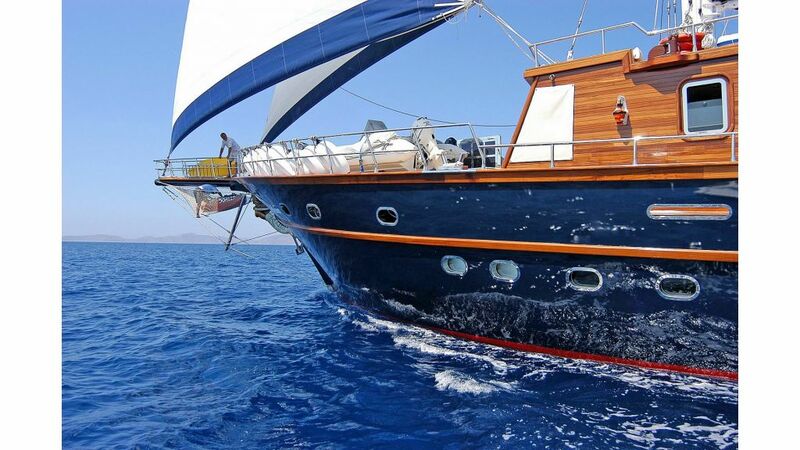 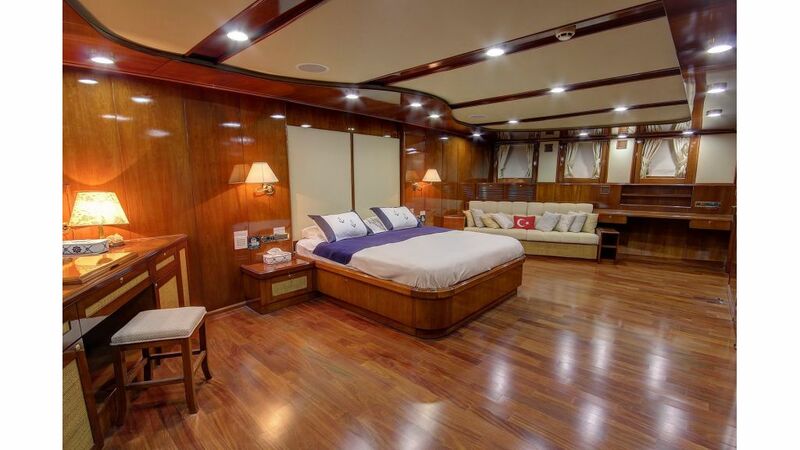 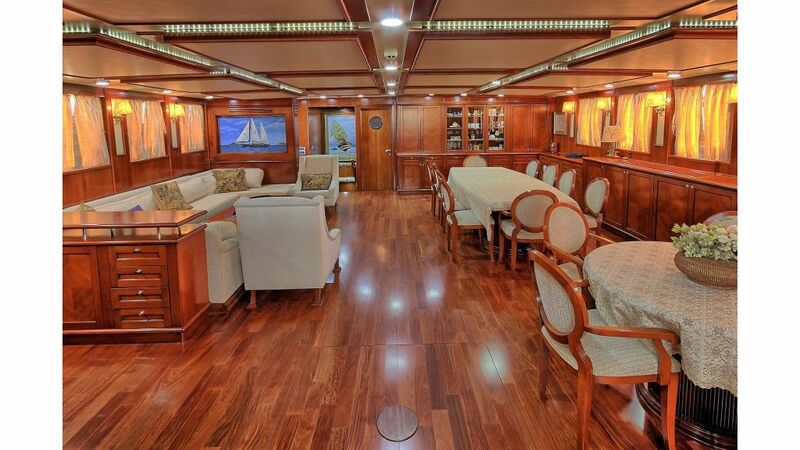 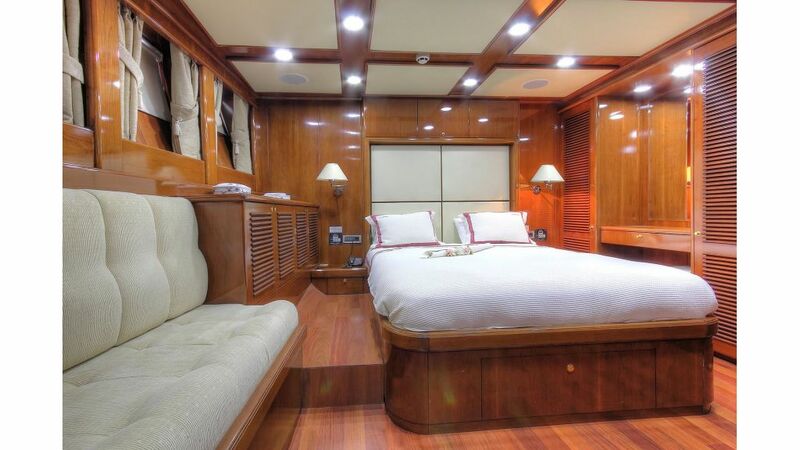 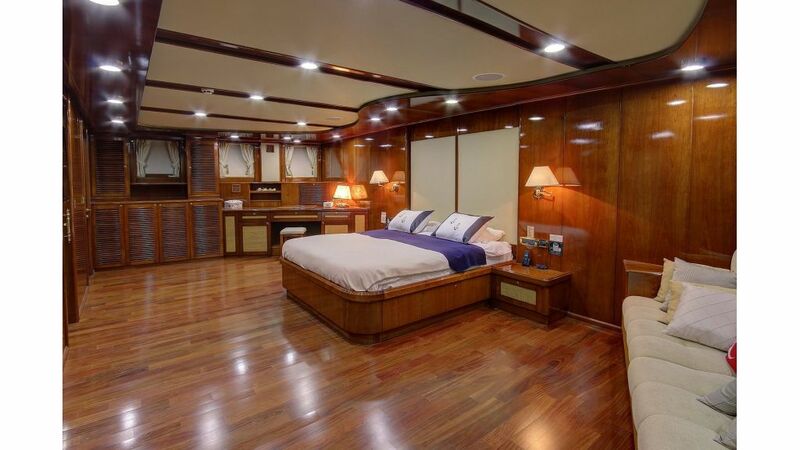 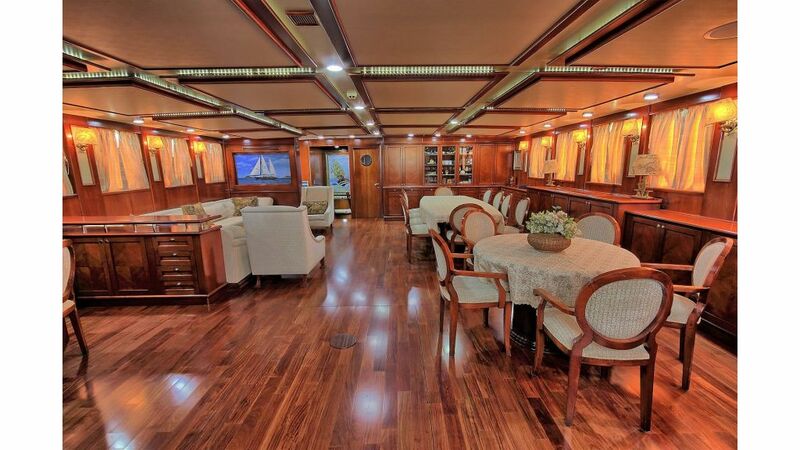 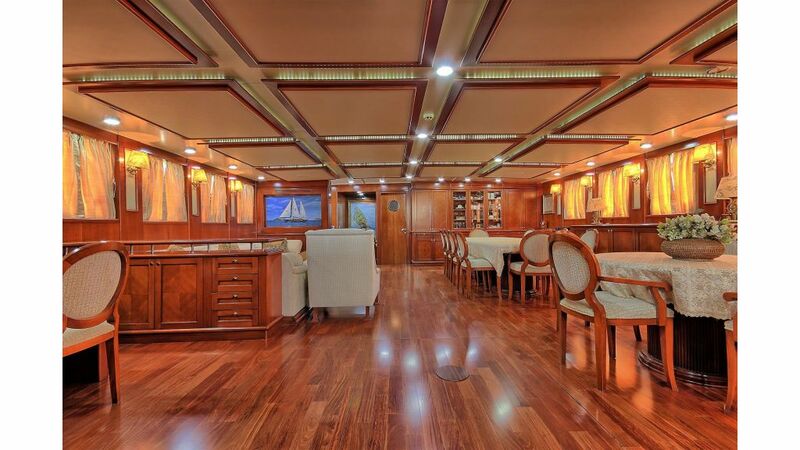 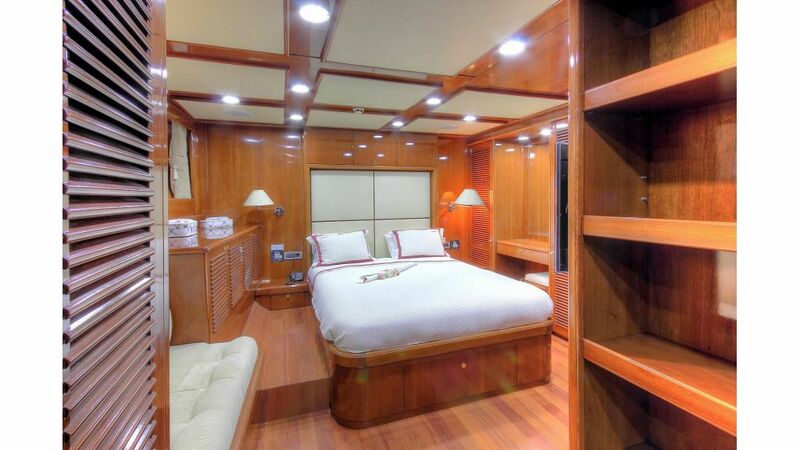 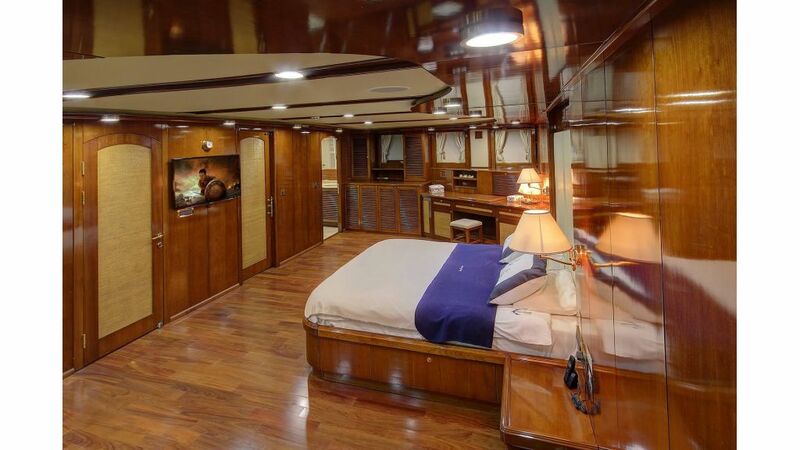 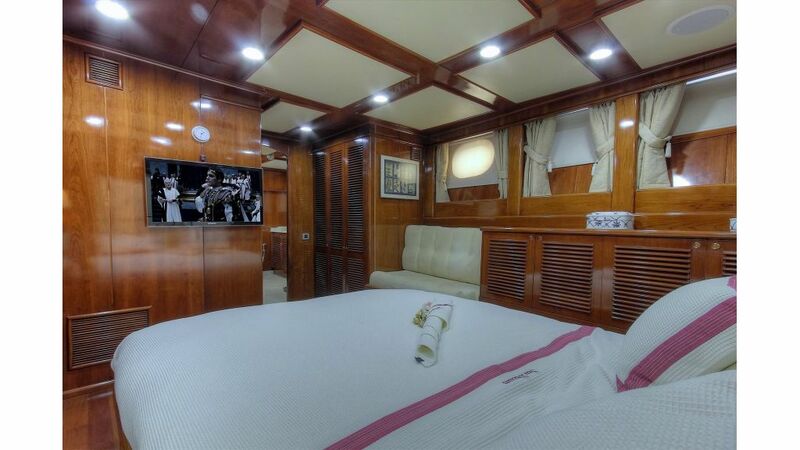 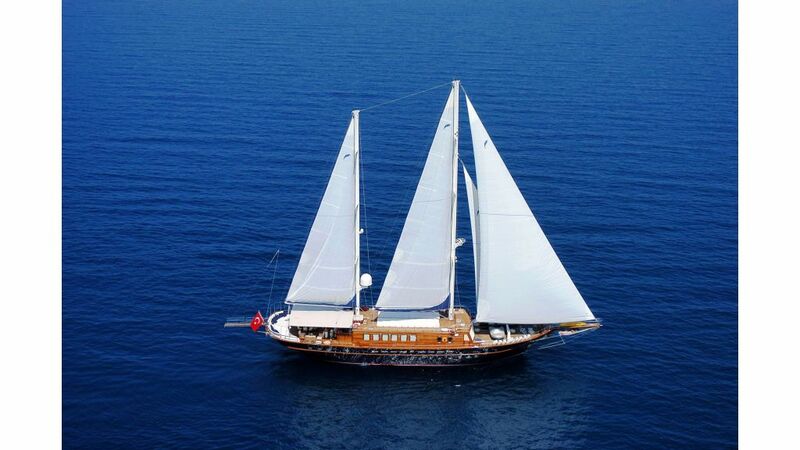 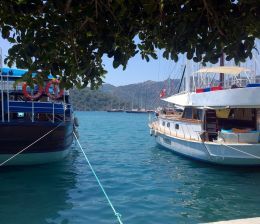 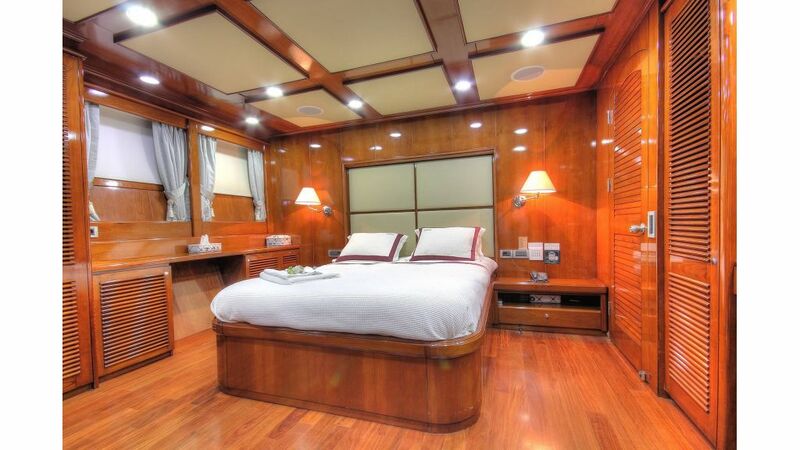 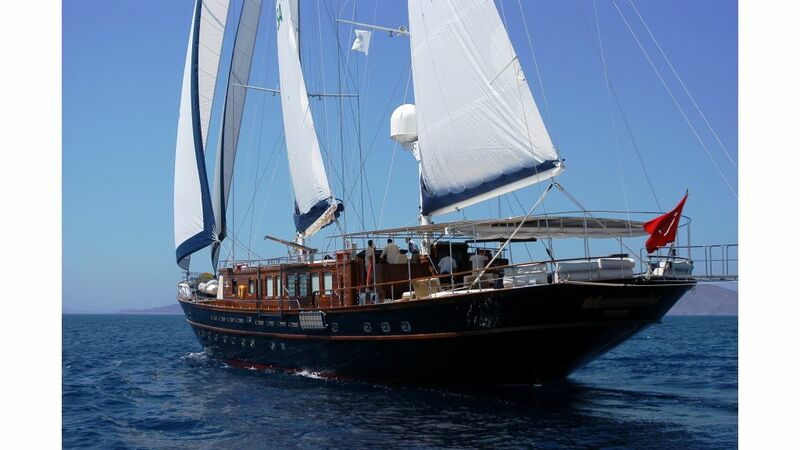 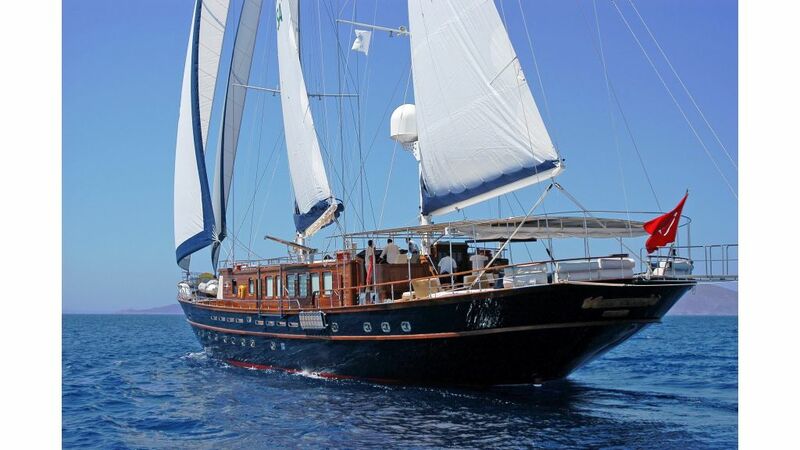 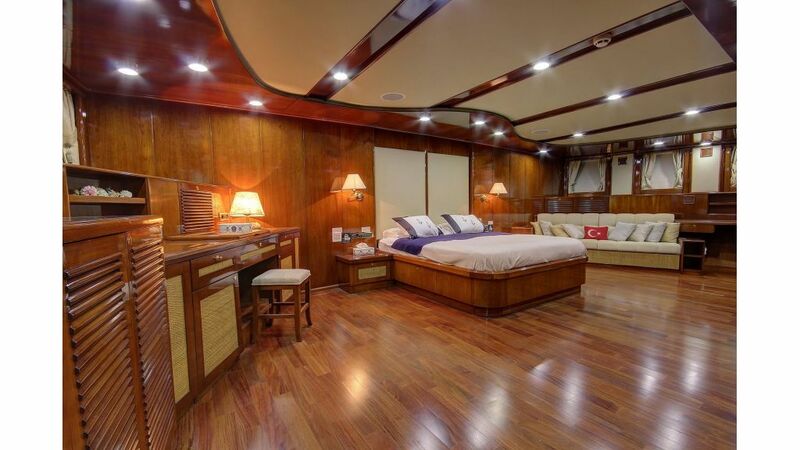 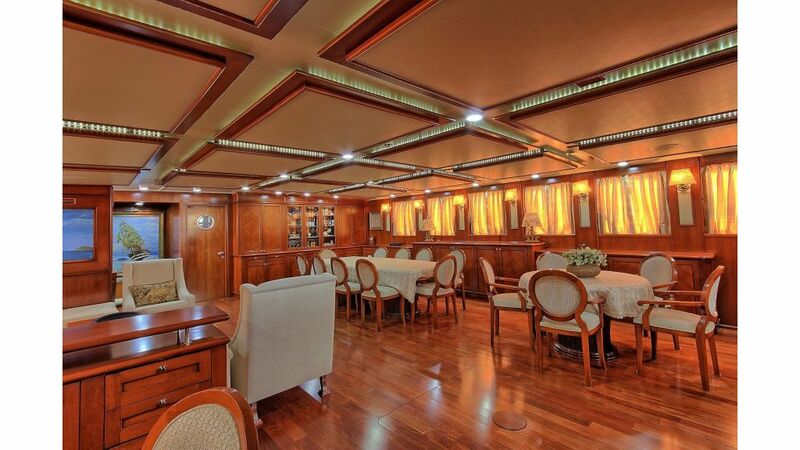 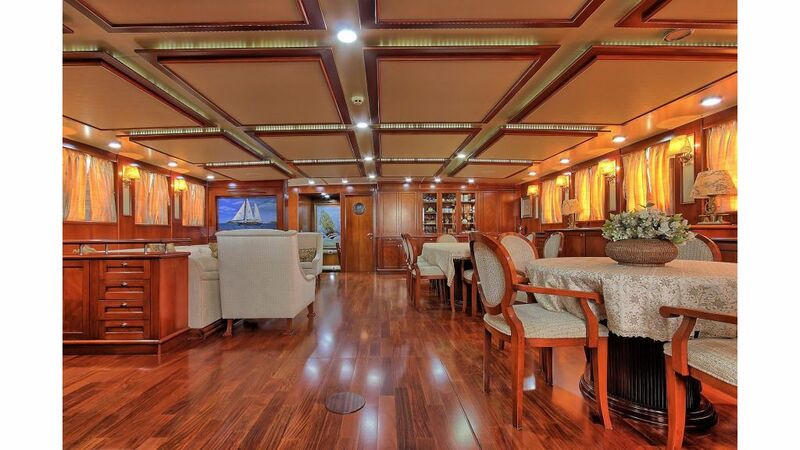 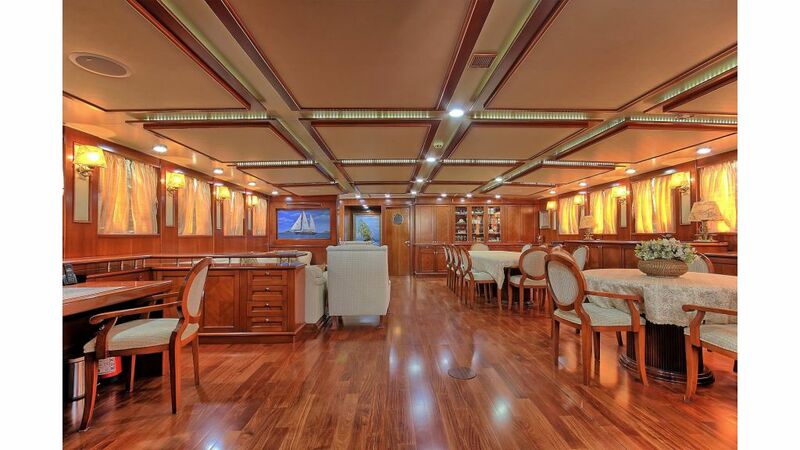 Sea Dream is a well proportioned Luxury Turkish gulet is very distinctive, large and spacious. 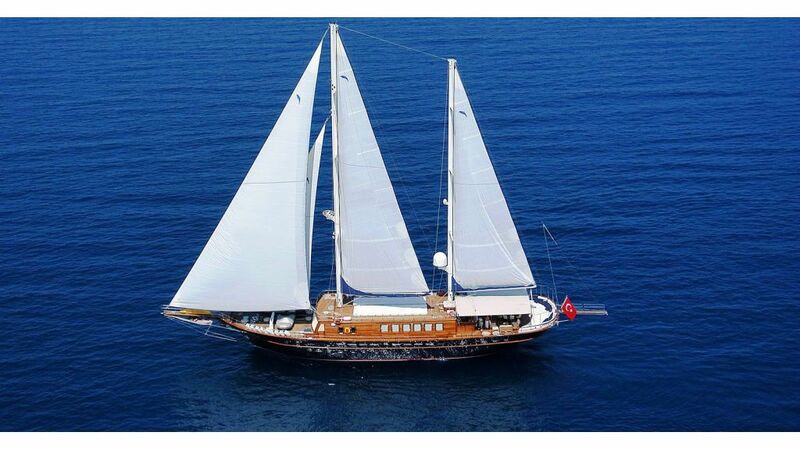 She could be described as mega gulet. 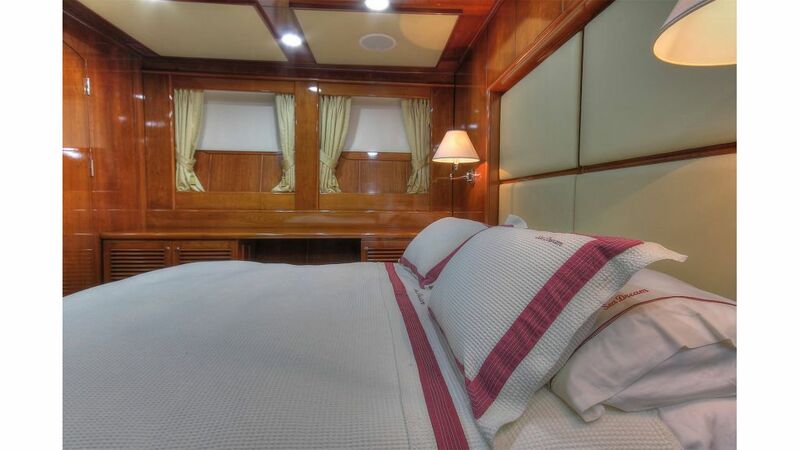 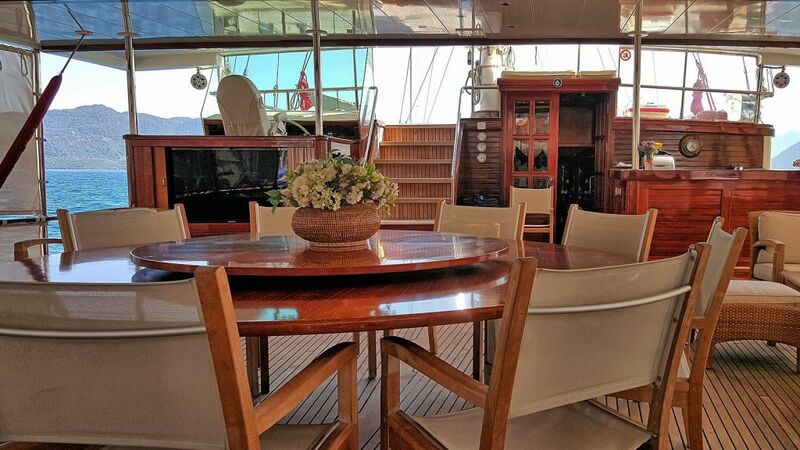 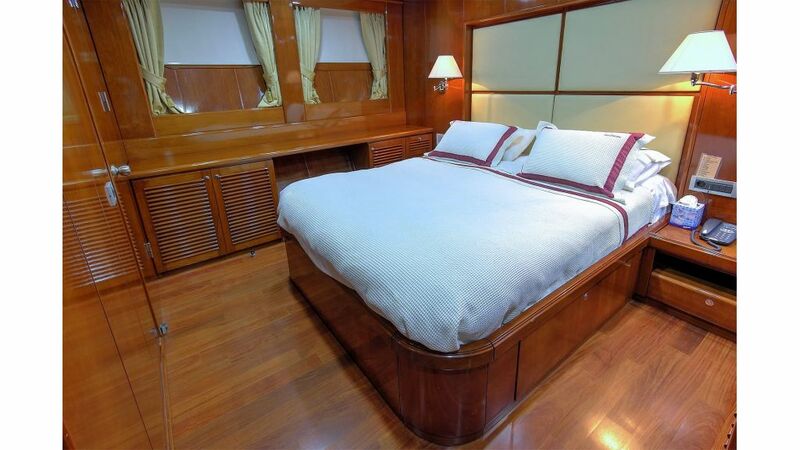 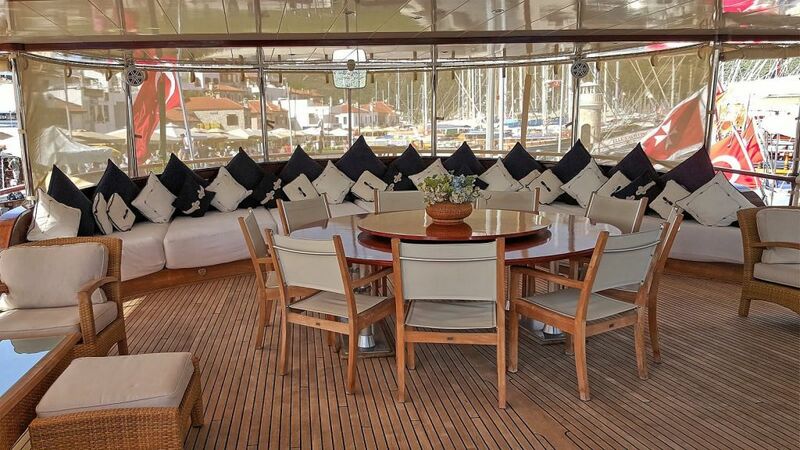 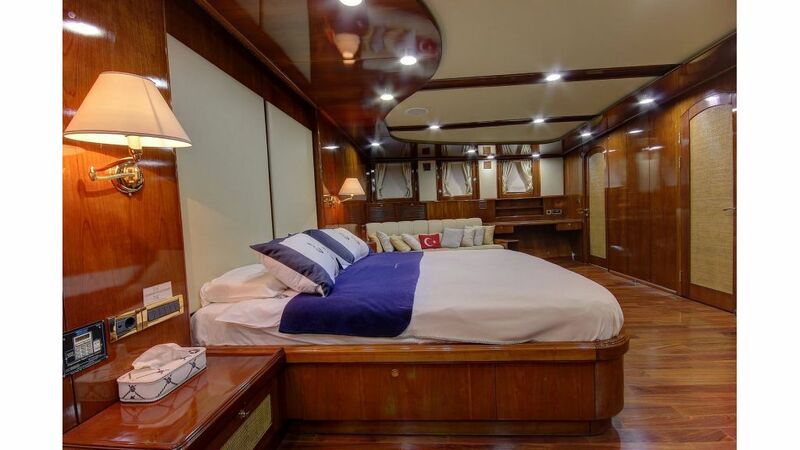 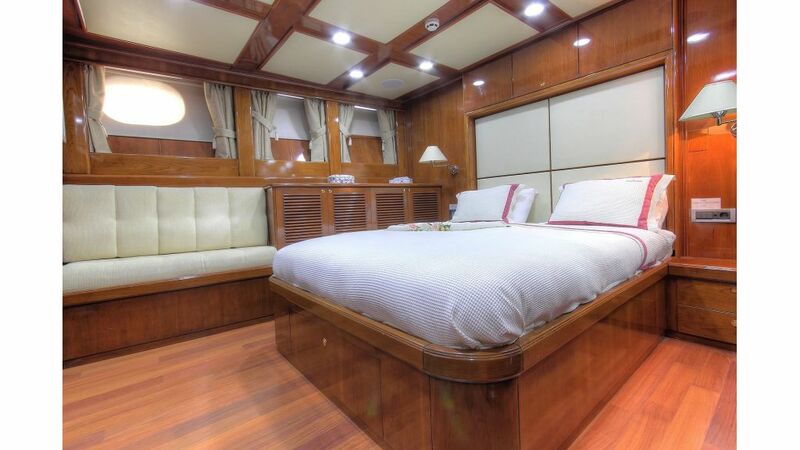 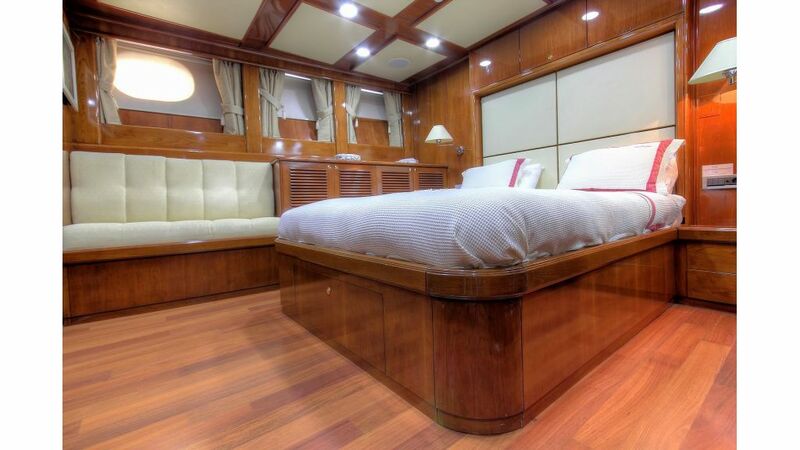 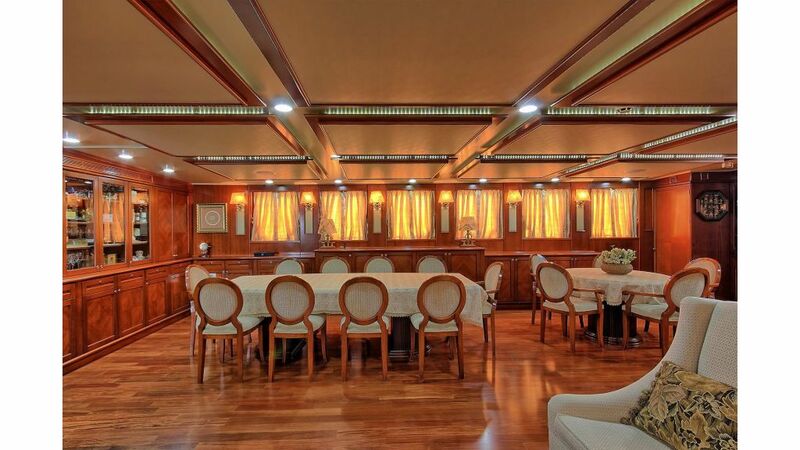 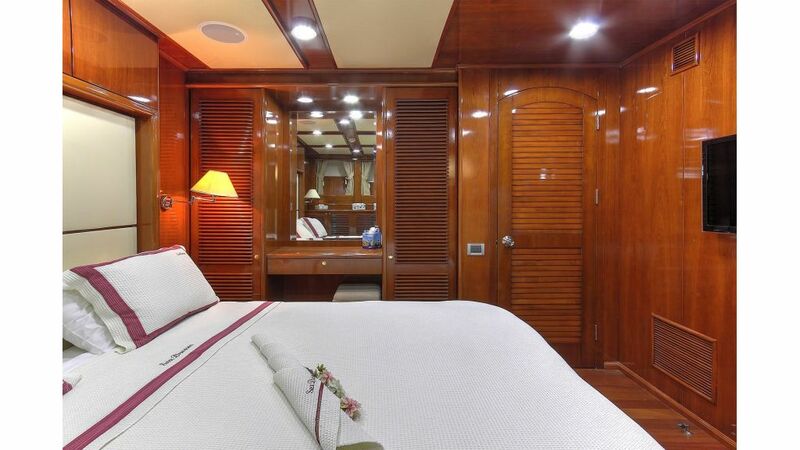 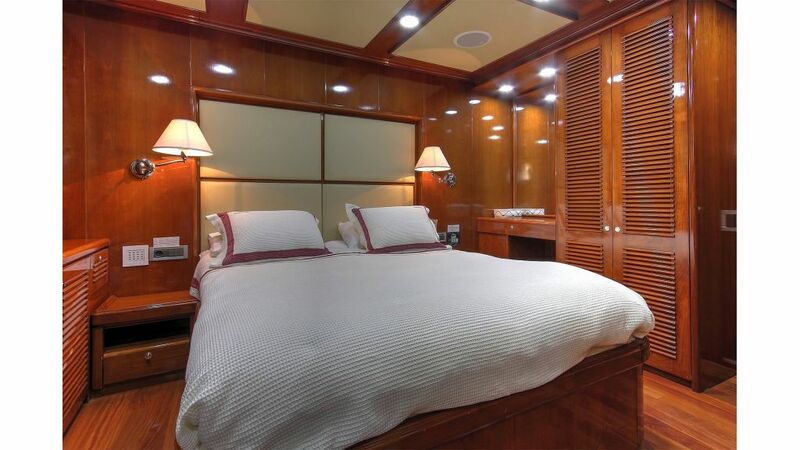 Sea Dream can accomodate 12 guests in 6 super spacious suits and her 8 professional yacht crew are ready, willing and able to entertain you with two large tenders and powerfull outboards to serve you water sports and water toys. 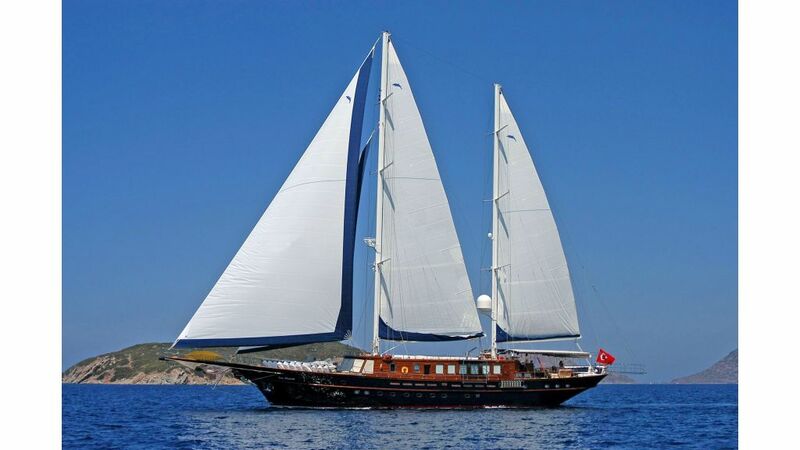 Length Overall : 128ft – 45.00 meters. 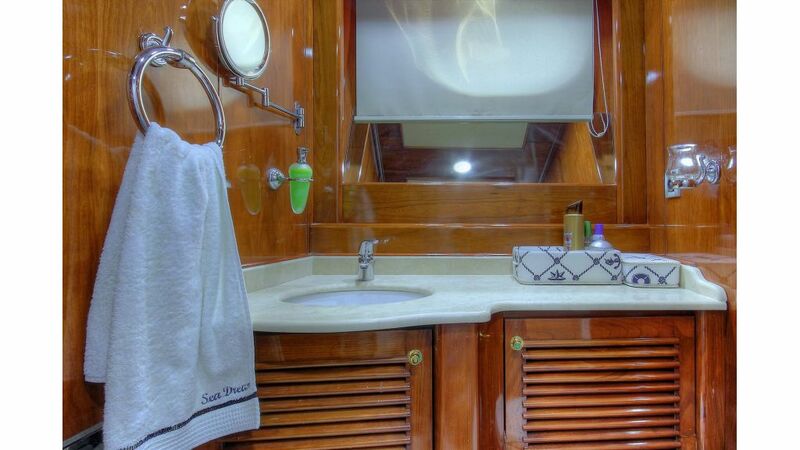 Length Waterline : 94ft – 28.80 meters. 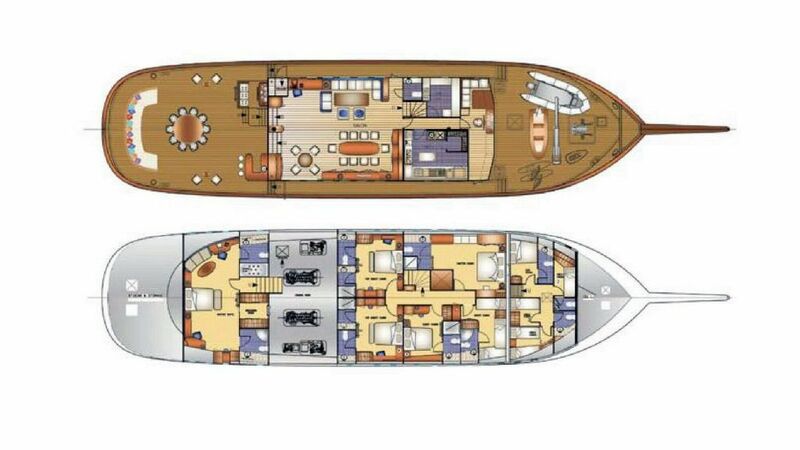 Breadth : 31ft – 09.55 meters. 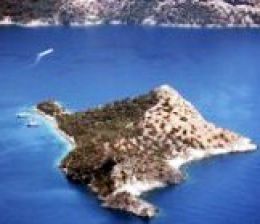 Draught maximum : 13ft – 03.90 meters. 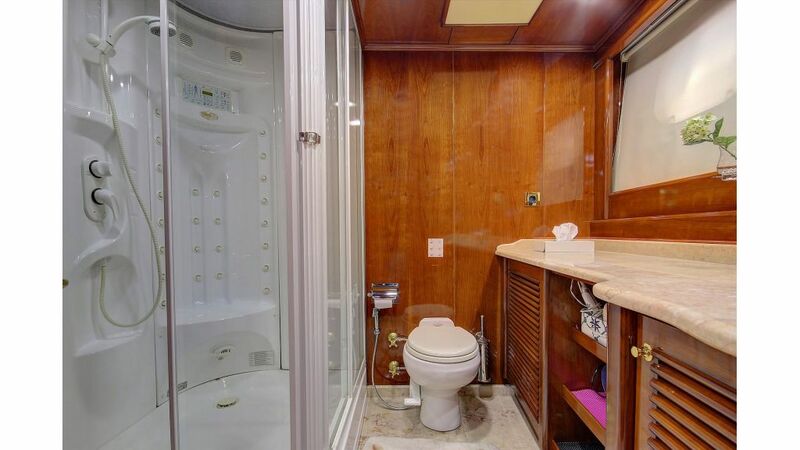 Range : 1000 Nautical miles. 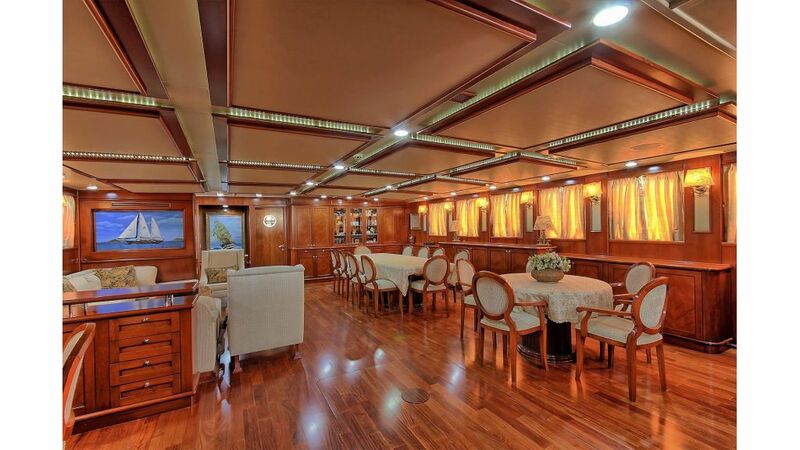 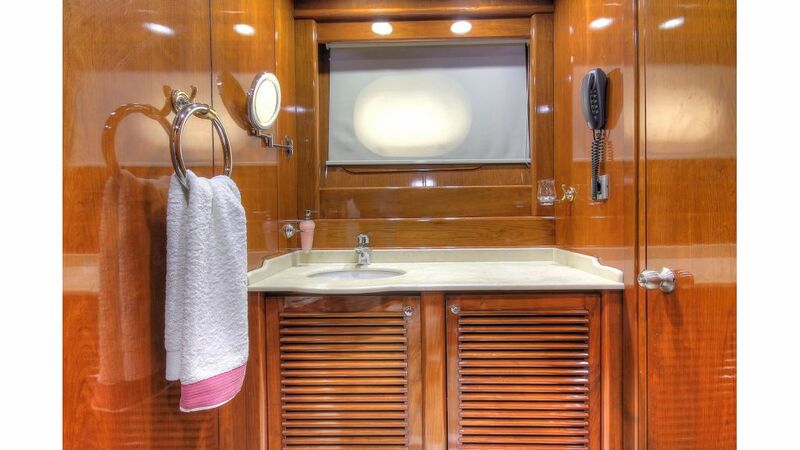 independently controlled in each cabin, saloon, galley and wheelhouse. 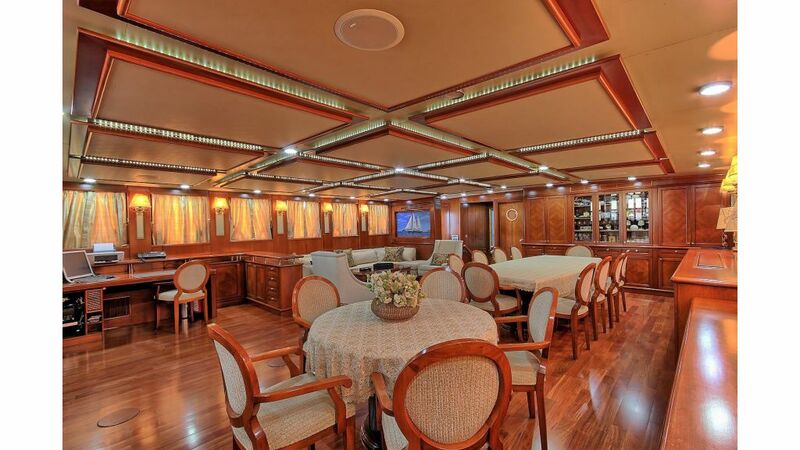 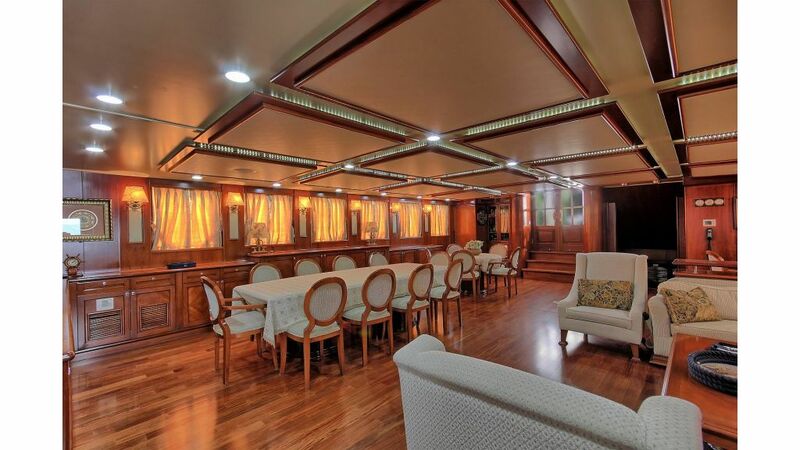 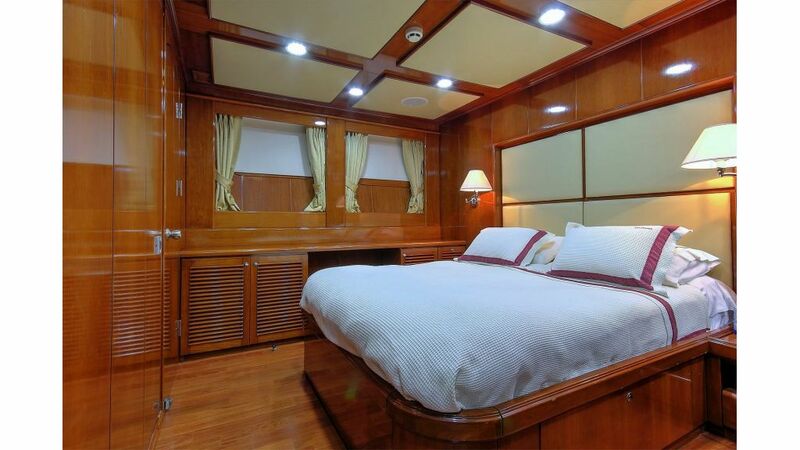 Accommodation : 6 guest cabins to accomodate 12 passengers. 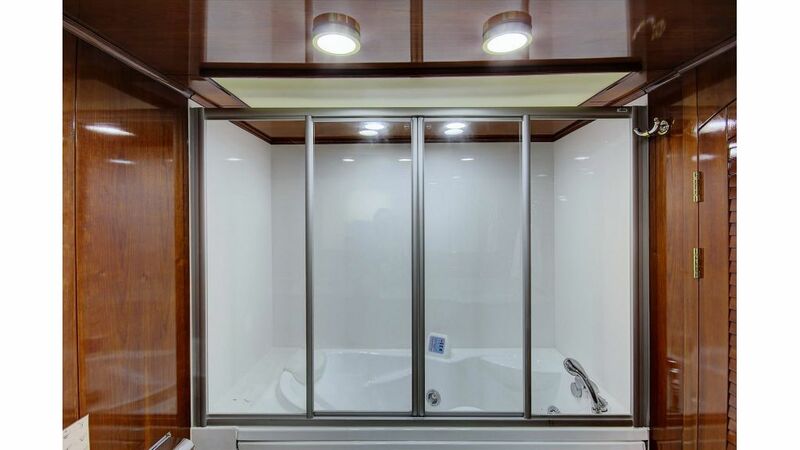 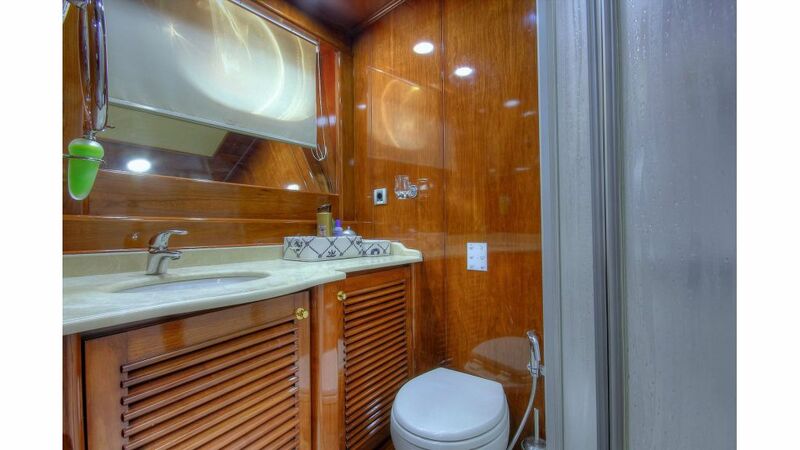 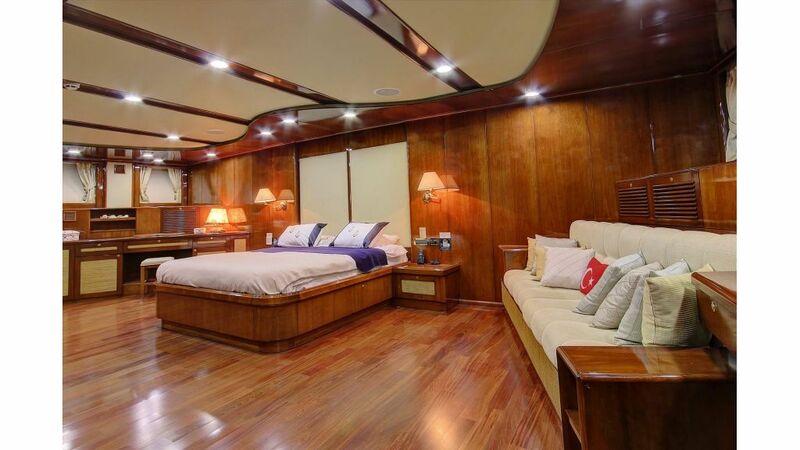 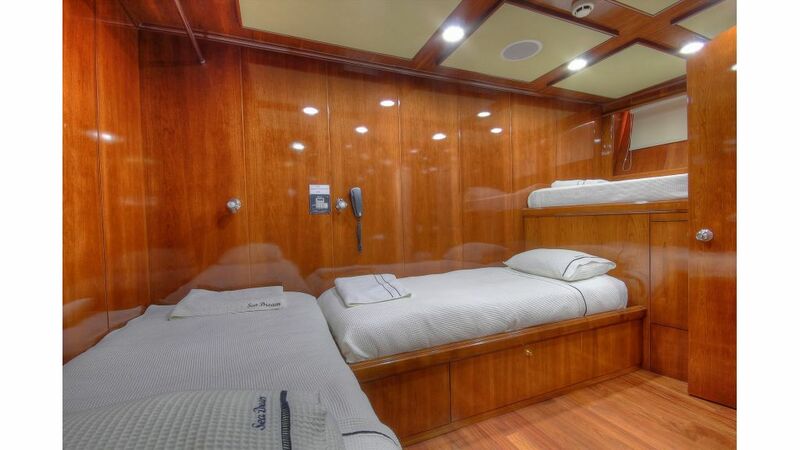 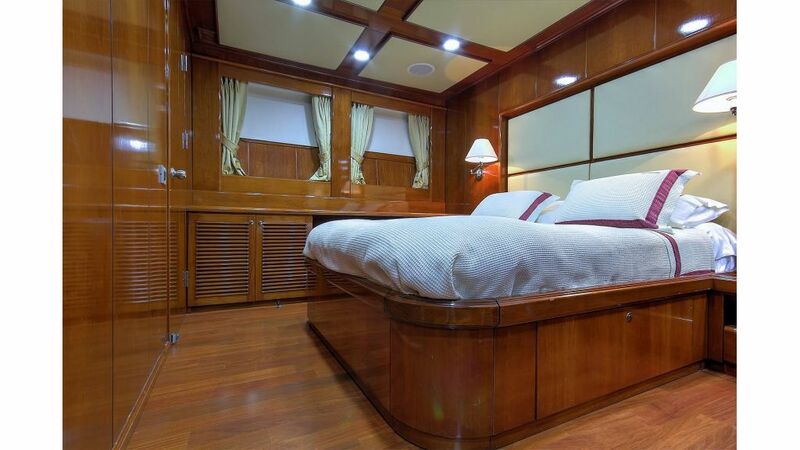 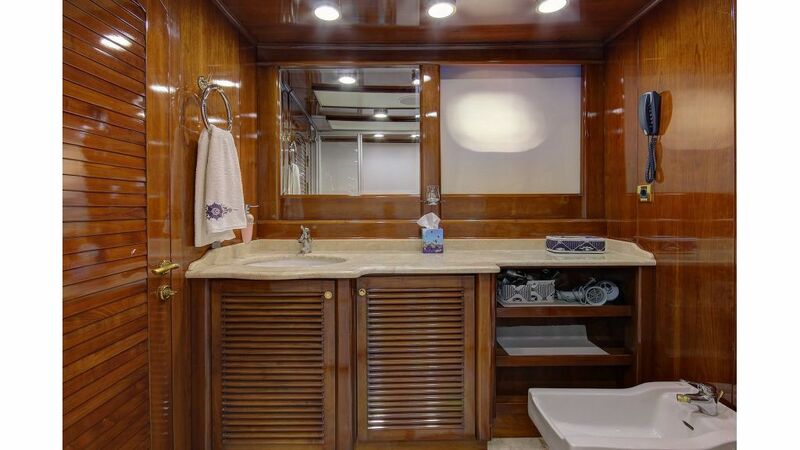 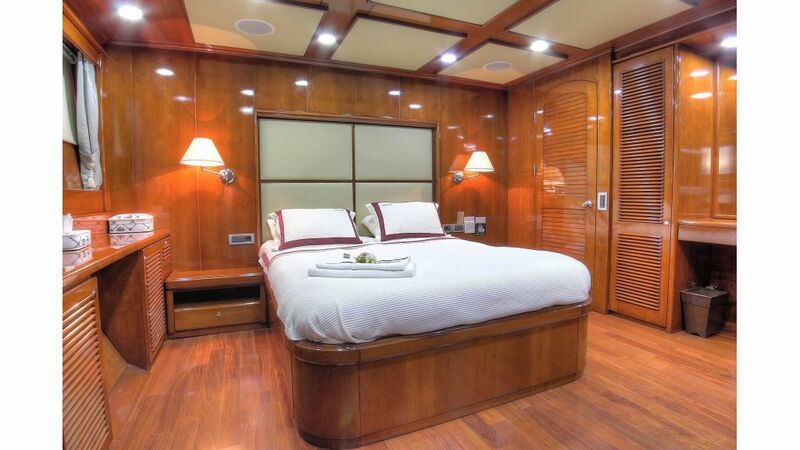 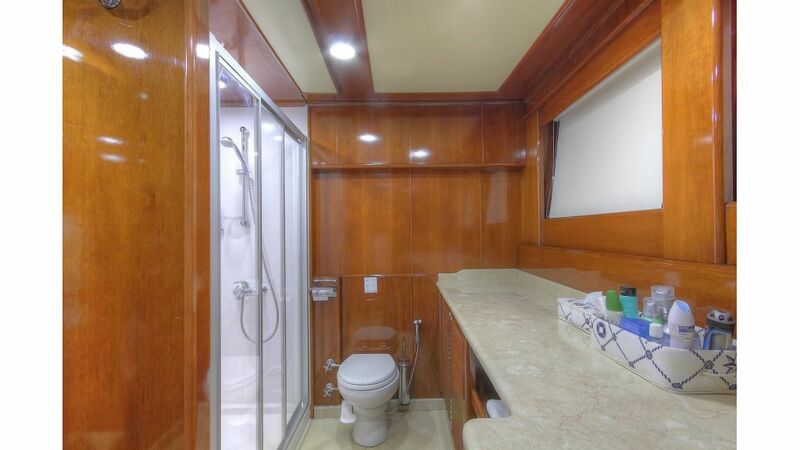 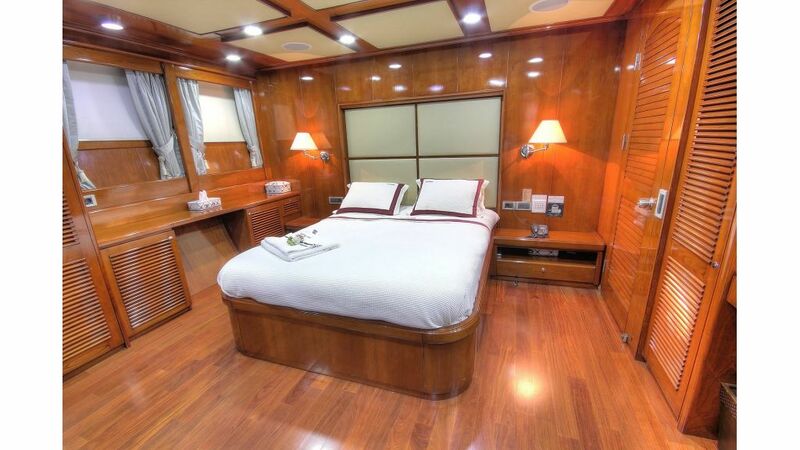 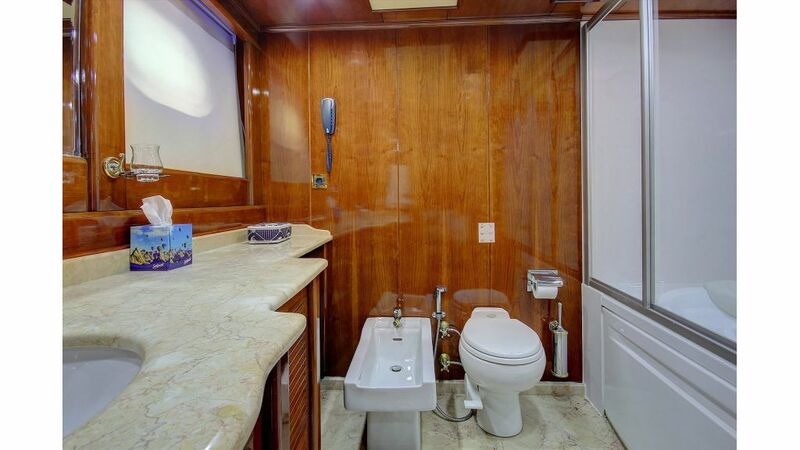 Crew Accommodation : 1 captain (double) with en-suite bathroom & 3 crew cabins accommodating 6 crew & 2 bathrooms. 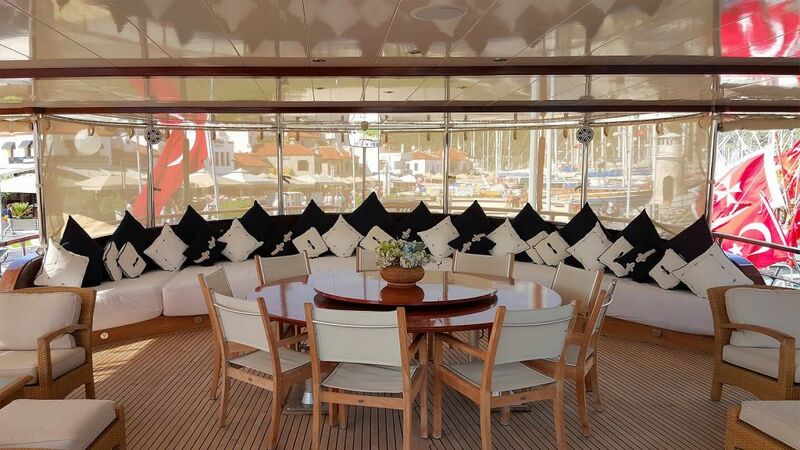 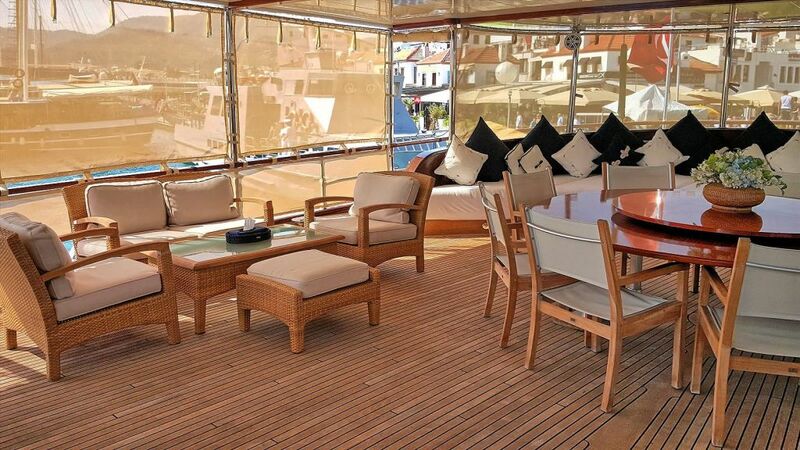 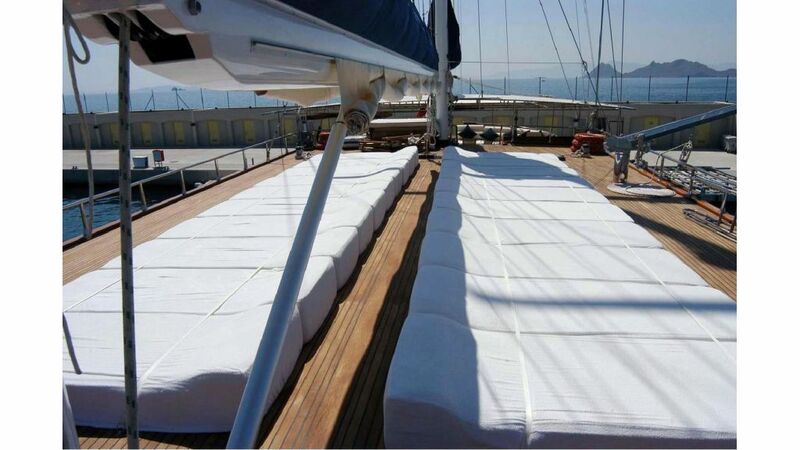 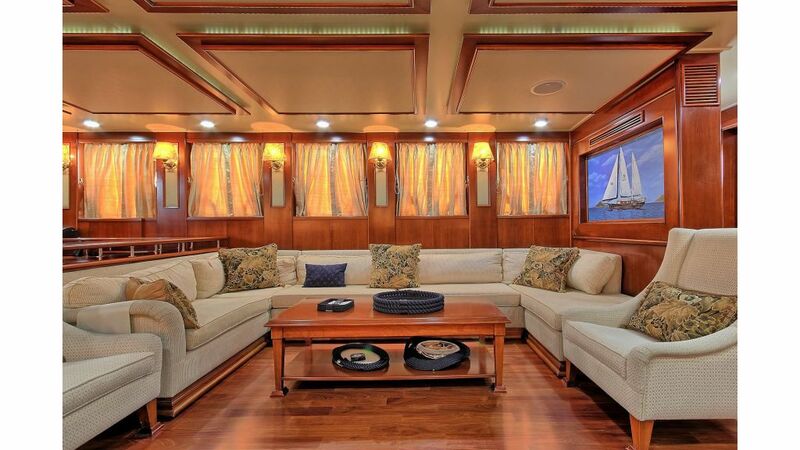 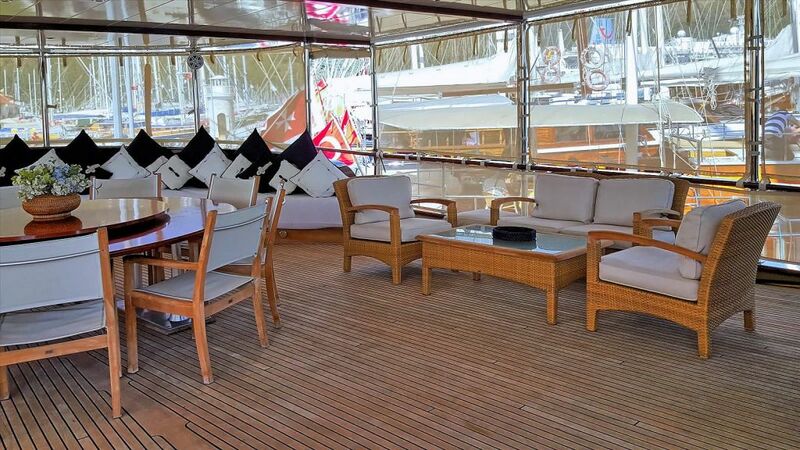 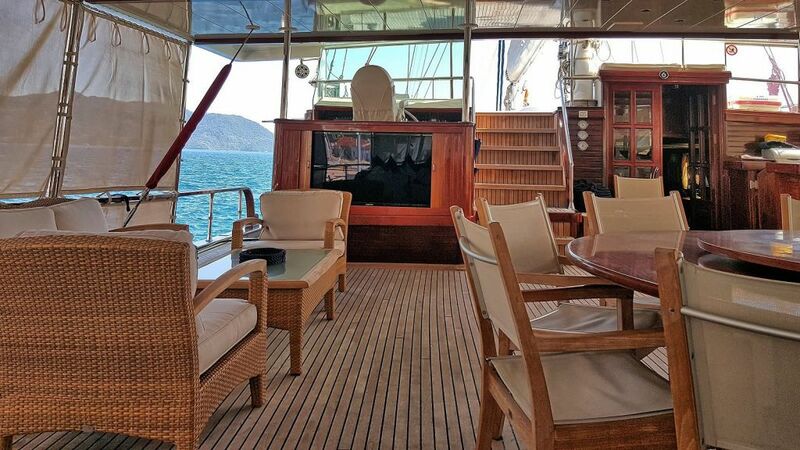 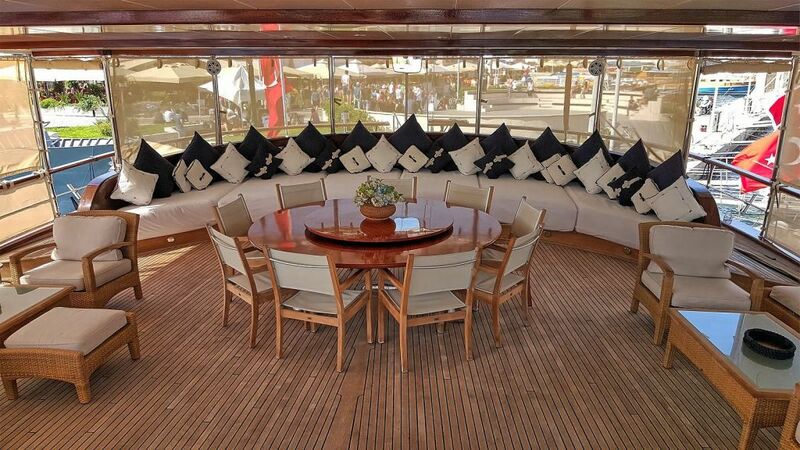 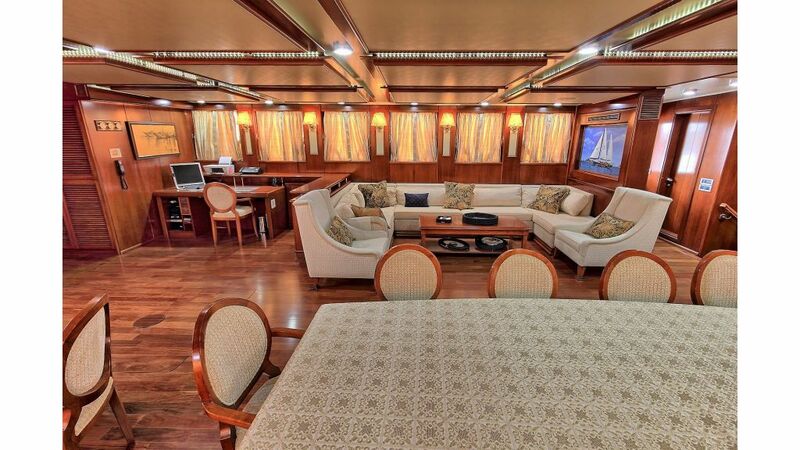 aft cushions 50 m2 of watertoys & sports deck forward 110 m2 upper deck with sun bathing cushions. 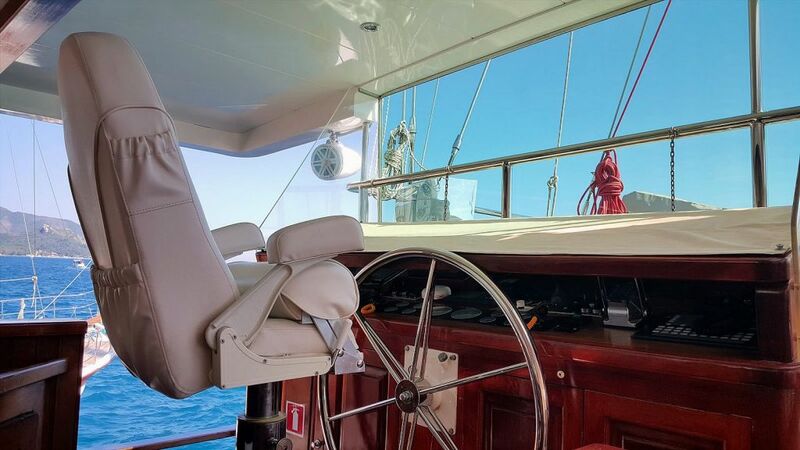 Repeater system for helm positions. 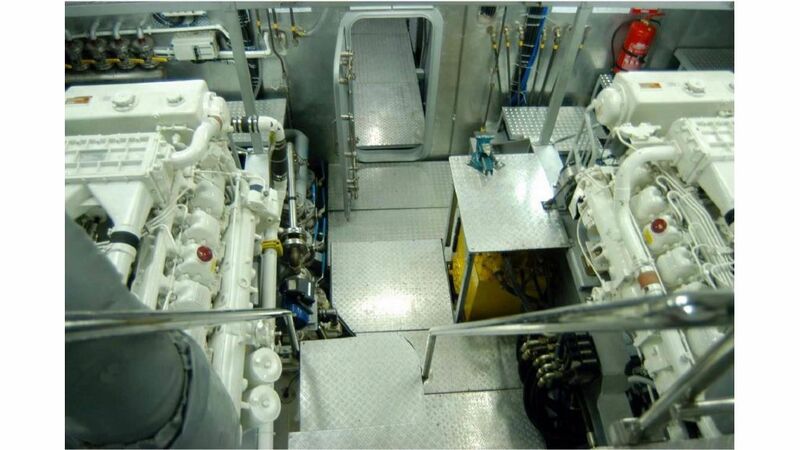 Automatic controlled C02 system for the engine room. 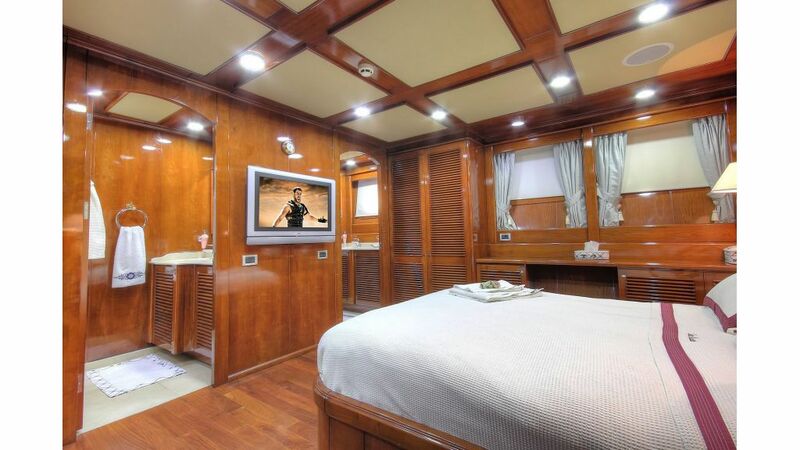 Entertainment : SONY Plasma TV, DVD & home theatre system in saloon. 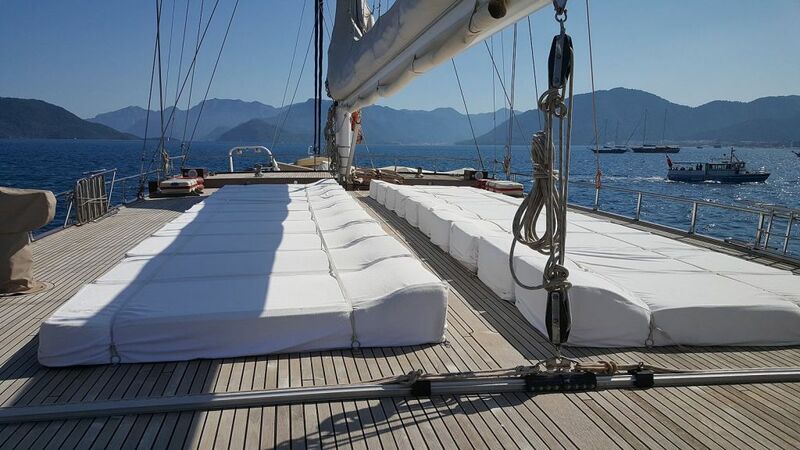 Tenders & Water toys : One, inflatable 5,80 meters. 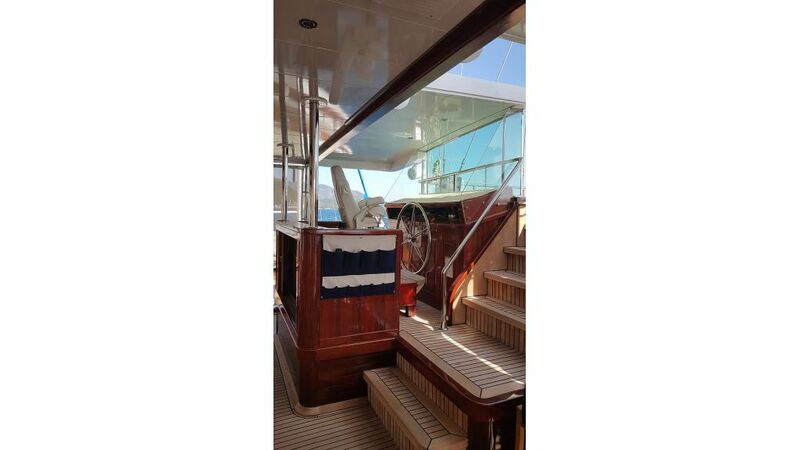 RIB TENDER with 150 HP outboard engine. 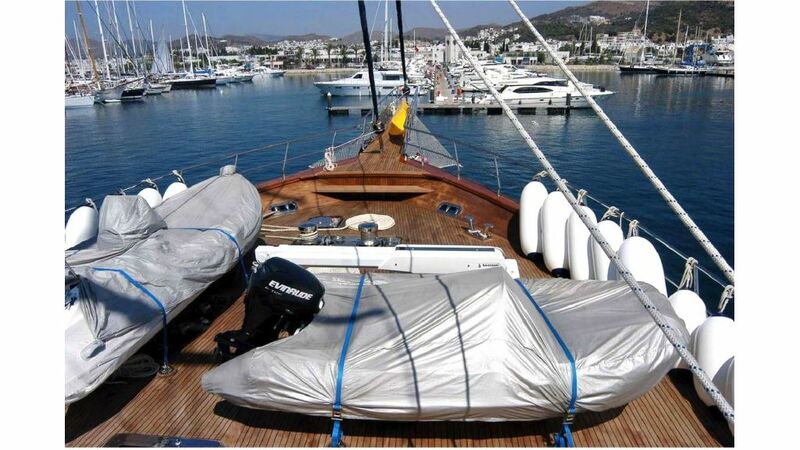 One, 5,20 m GRP RIB tender with 100 hp outboard engine.